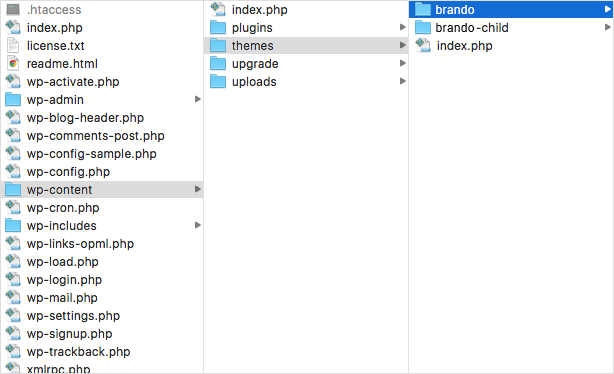 Follow below steps to install Brando WordPress Theme theme through FTP. Extract the brando.zip file (Downloaded from ThemeForest) and ONLY use the extracted Brando theme folder. Upload extracted theme to your server in the wp-content/themes folder. See below image for more information. Once the theme is uploaded, you need to activate it. Go to Appearance > Themes and activate your uploaded theme. After activation of Brando theme, you will be redirected to Welcome Screen where you can see notification message to install and activate below required & recommended plugins. Step 6: Start installing each plugins by simply click on install button and activate all plugins.